If the Doubler settings are acceptable, pressing the Space Bar to play the rendered audio. You can save time by soloing the output track(s) you will want to hear first. To solo the Output (in Track 2 -"Output 1") on its own - press the A Key. To solo both the Output signal and the Input (in Track 1) - press the E key. To solo the Input signal (In Track 1) on its own, press the G key. Normally, the doubler output should ALWAYS be played with the input to hear the effect correctly. Note: If background processing is not turned on, and a red line still shows above the output track), the APT process needs to be rendered before it can be played. 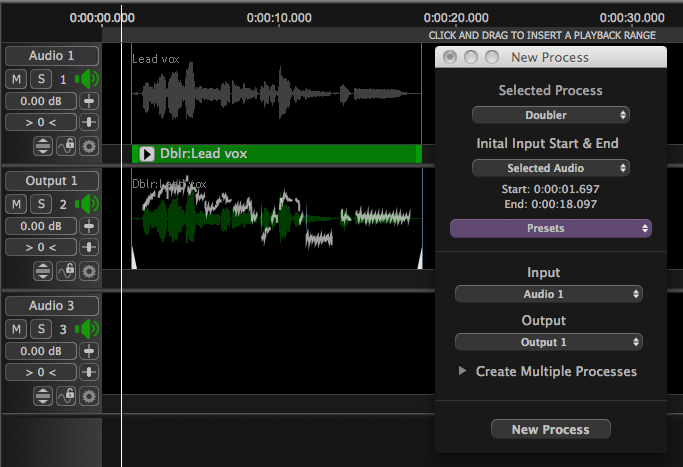 The Output is shown already rendered as the doubled waveform in green below in "Output 1". Simply press the Space Bar to render and play the result. Consult the rendering and background processing preferences for details of the other options for rendering processed audio. Quite often, the above steps will provide a satisfactory result with little or no further effort, apart from transferring the output audio to your DAW or a file. You can alternatively use a Playback Range to highlight time periods of the audio to be Doubled, rather than relying on automatically selected audio.